The Redpark Gigabit + PoE Adapter connects iPads and iPhones to ethernet and uses power over ethernet (PoE) to charge the device. This enables an iPad to receive both data and power over a single Ethernet cable when connected to a PoE-enabled switch or a PoE injector. 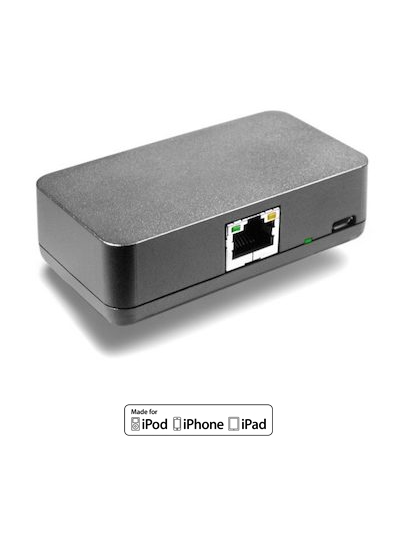 This iPad ethernet adapter is instantly recognized as a network connection. The ethernet connection is available for use by any iOS app and can be configured using the Settings app on the iPad when running iOS 10 (or later). The adapter physically connects to the iPad or iPhone using a Lightning to USB Micro B cable (sold separately). It supports 10/100/1000 networking and provides bandwidth up to 225 Mbps. Q: How do I configure the network connection? A: Using the Settings app on your iPhone or iPad. Once the Adapter is connected to an iPad or iPhone, “Ethernet” will appear in the Settings app in between WiFi and Bluetooth. Both DHCP and Static IP addresses are supported. Q: What apps can I use with the Gigabit + PoE Adapter? A: The network connection provided by the Gigabit + PoE Adapter can be used by any iOS app. Q: What is the maximum bandwidth of the ethernet connection? A: The Gigabit + PoE Adapter is a specialty form of USB 2 to Ethernet Adapter. It provides bandwidth up to 225 Mbps. The maximum bandwidth is dependent upon the USB sub-system in the iPad or iPhone. Q: Can I share an iPad’s or iPhone’s cellular data connection over the ethernet connection? A: Not currently. Perhaps a future version of iOS will support this. Q: How much power does the Adapter draw? A: The Gigabit + PoE Adapter is an 802.3(af) Class 0 device. It requires the PoE-enabled switch or the PoE injector to supply 15.4W. Q: How much power is provided to the iPad? A: Up to 2.1A (5V). This is enough to fully charge/power any model of iPad or iPhone. Q: Can the Adapter operate without drawing power from a PoE-enabled switch or PoE injector? A: No. The Gigabit + PoE Adapter is not able to draw power from the iPad. It must receive power from PoE. Q: Can I connect the Adapter to any PoE-enabled Ethernet hub or switch? A: The Adapter supports a 10/100/1000 Mbps Ethernet connection. It is compatible with all PoE enabled ethernet hubs and switches that are able to provide 15.4W to the Adapter. See our Quick Start for further details. Q: Can any type of ethernet cable be used to connect the adapter to the PoE injector or PoE-enabled switch? A: Use Cat5e, Cat 6 or Cat 6A cables. If the distance between the Adapter and the PoE power source is 100 ft or more, we recommend Cat 6A cables. Q: Does the Adapter have LEDs to display network status? A: Yes. There is a power LED as well as LEDs to display network link status and network activity. Q: Why does the Adapter have a Micro B USB port instead of a Type A USB port? A: The Type A USB port is used on devices that function as a USB Host. This Adapter functions as a USB device so it must use a Type B USB port. We chose a Micro B version in order to save space on the circuit board in the Adapter. Q: Does the Adapter have a unique MAC address? A: Yes. Each Adapter is programmed with a unique MAC address during the manufacturing process. A: iOS 10.0.x or later. Q: What is the size of the Gigabit + PoE Adapter? A: The Adapter is 3.25″ x 1.75″ x 1″. Q: How can I tell if my iOS device recognizes the Adapter? A: Open the “Settings” app on your iOS device. Select “General” then “About”. If the Gigabit + Power Adapter is detected properly it will appear in the list shown. Q: I’ve connected the Gigabit + PoE Adapter to the iPad but I do not see “Ethernet” in the Settings app on my iPad. What do I do? • Are you running iOS 10.2.x or later? • Make sure the Lightning to USB Micro B cable is connected at both ends. • If you are using an ethernet switch make sure it is a version that provides PoE. • Make sure the Ethernet cable is fully connected to the Adapter and to the PoE switch or injector. • Try a different PoE port on the switch. • Try a different ethernet cable. If you are using a long ethernet cable (i.e. 100+ ft) try replacing a Cat5e cable with a Cat 6A cable. • Make sure the PoE switch or injector can provide 15.4W to the Adapter. Do you have multiple PoE devices connected to the PoE switch? If so, the switch may not be able to power all devices fully. (This will depend upon the switch you are using and the other PoE devices that you are using.) Try removing other PoE devices from the switch to see if this allows the Adapter to work as expected.